One high quality method of restoring teeth following decay or damage is with dental bridges or dental crowns in Medford. At Island Daily Dental Care, Dr. Gary Rosenfeld provides these restorations over the course of two visits to our office. In the first, we will prepare your tooth for the restoration, then give you a temporary to wear in the time between appointments. About two weeks later, you return for the final placement of your new crown or bridge. Dental crowns solve a variety of issues with teeth in the front or back of the smile. Crowns made of high-quality porcelain look just like the rest of your smile, so they are best for the teeth that you can see. For damaged teeth in the back of the mouth, gold or metal alloys may be preferable. Dental bridges replace one or multiple consecutively missing teeth. By putting a “placeholder” in the gap, a dental bridge prevents the surrounding teeth from drifting out of position and creating orthodontic alignment issues. The dental bridge also restores a patient’s ability to chew, speak, and smile with more confidence. The dental bridge works using the two teeth surrounding the gap as anchors, or abutments, for the prosthetic teeth that fill in the space between. With a sturdy crown on either tooth, the dental bridge provides a long-lasting solution to tooth loss. At Island Daily Dental Care, we will reserve at least two visits for the completion of your crown or bridge. The first is for treatment planning and preparation. We will take impressions of your prepared tooth/teeth and send the information to our dental lab, which will create your new restoration out of the highest-quality materials. After the crown or bridge has been prepared, you come into our office where Dr. Rosenfeld checks to make sure it will fit and function just like it should. Any necessary last-minute adjustments are made and the crown or bridge is securely affixed in the smile. Because the procedure is carried out over two appointments to our office, you will wear a temporary crown (or two in the case of the bridge) between the first and second phases of treatment. Be careful with this restoration, as it was not meant to withstand serious pressure. Try to limit chewing to the other side of your mouth, and avoid very chewy or hard foods altogether. Don’t worry — it won’t be long before your tooth has been restored and you’re eating regularly once again! 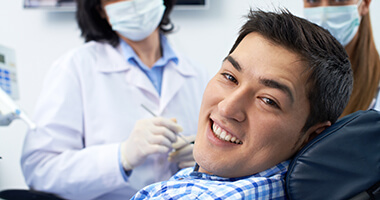 If you have an aching or damaged tooth, or if you are missing one or more teeth altogether, chances are good that you can benefit from dental crowns or dental bridges in Medford. Dr. Rosenfeld provides high quality restorative dentistry at Island Daily Dental Care! Request an appointment to enjoy full smile health once again.